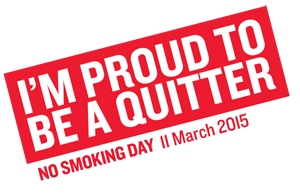 No Smoking Day, 11 March 2015 – the day you start to stop? While 11 March is No Smoking Day 2015, you can quit on any day of the year. It’s time to stub out those cigarettes once and for all, hold your head up high, and be proud to be a quitter. No doubt you’ll have heard about the negative effects of smoking on your health and wellbeing, not to mention your wallet or purse! If you are a smoker you are even more likely to be aware of these factors; you’re probably getting regular reminders from friends, family and/or colleagues! Have you wondered about becoming a quitter? Do you wish that you could kick the habit? Do you know that help is available for free from Stop Smoking Wales? Stop Smoking Wales is a free, NHS service to help you quit smoking. Research has shown you are four times more likely to quit with a support programme like Stop Smoking Wales than going it alone. Stop Smoking Wales provides evidence based advice and behavioural support for adult smokers who want to stop smoking either face-to-face or by telephone. You can call 0800 085 2219 to find out about help that’s close to your place of work or home and available at various times (day, evening and even weekends). 8 hours without a cigarette, the nicotine levels are reduced to half while the oxygen levels return to normal. 24 hours without a cigarette allows carbon monoxide to be eliminated from the body while mucus and smoking debris are gradually cleared out of the lungs. At 48 hours it is suggested that nicotine has cleared from the body, depleting the physical addiction. 3 days into cessation bronchial tubes to the lungs begin to relax which allows breathing to become easier and energy levels to rise. The more time since cessation, the more health benefits prevail. CIRCULATION within the body can improve, from as little as 2 to 12 weeks, which in-turn lowers the risk of heart attack by roughly half that of a smoker after only one year without smoking. After 15 years this risk of heart attack is further reduced to that of a non-smoker. BREATHING can also improve relatively quickly. At 3 to 9 months lung function improves by up to 10% which allows for better lung function, higher energy levels and less chance of developing lung cancer. After 10 years of smoking cessation, the risk of lung cancer is approximately half of a non-smoker. If you are not quite decided on whether to quit or just want to talk about the help that is available you can contact Jennifer Prosser, Staff Occupational Health and Wellbeing Adviser on 029 2087 6768 or email staffhealth@cardiff.ac.uk.